Check out our annual year in review e-newsletter, featuring a message from our Interim Head of School, Andy Hess, Faculty & Staff updates, acknowledging our generous donors, and much more! 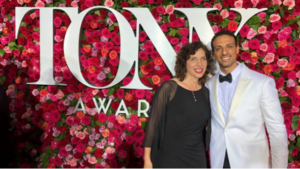 TWO TEHIYAH ALUM WIN BIG AT THE TONY'S! Ari’el Stachel, 26 and Itamar Moses, 41, both of whom attended Tehiyah Day School, took home top honors in the 72nd annual Tony Awards ceremony at Radio City Music Hall on June 10. Itamar took home the award for best book for the same production. Alice's Adventures in Wonderland takes Center Stage! As you may know, each year at this time, our middle school play is a highlight for our entire community! Our middle schoolers work so hard not only as performers but also as a tech crew responsible for the backstage magic of lights, sound, sets, props, and costumes! Shavuot + Grand Friends = Friday Funday! Grand Friend's Day is nearly here and we can't wait! Our special visitors are toe-tapping in anticipation, and boy are we excited! Shake your groggers - it's PURIMPALOOZA! The month of Adar is here and Modeh Ani will never be the same! The excitement trickles down the festive hallways adorned with bursts of color and fun! Decorations glitter in the sun, busy hands are planning, crafting and lovingly creating the most amazing prizes in all of the East Bay. Join us for the best Purim Carnival around - it's PURIMPALOOZA! Combating the Winter Blues with Amazing Art! At Tehiyah, our students stay warm and cozy making magic in the art room with Janet and her steady team of volunteers. Check out all our students are up to! $10,000 Shira Legacy Scholarship boosts access to Middle School program! Tehiyah is excited and takes great pride in announcing our $10,000 Shira Legacy Scholarship for new incoming students to our Middle School! This scholarship honors the memory of alumna Shira Ulmer (nee Riff), whose commitment to our values: gratitude, acts of loving kindness, courage and leadership, was truly inspiring. Please help us spread the word! We can't wait to welcome new inspirational students into our Tehiyah community! BOOK FAIR is all new! SHOP LOCAL. SHOP HANUKKAH. JUST SHOP. Need to streamline and check off your to-do's?? Come to Tehiyah where you'll pick up something new! Local Artists, Local Book Store, Local Shops. You want it? We got it. TINKERS TO THE LEFT, INVENTORS TO THE RIGHT! THINK TEHIYAH is back and we can't wait for a day of tinkering, robotics and DIY projects! This free event will feature activities for children and grown-ups of all ages and highlight Tehiyah's JSTEAM curriculum. Activities will include apple-pressing, LEGO Engineering, fabric, jewelry projects and more! BBQ (with veggie options) will be available for purchase. TPO's SUKKOT UNDER THE STARS IS BACK! !